Mikhail Grigorenko could be the safest bet for Montreal this June. Following a 2-1 shoot-out loss at the hands of the Carolina Hurricanes this week, the Montreal Canadiens have ensured that they will finish no better than 28th overall in the National Hockey League standings. By nature of the draft lottery system, the loss actually comes as welcome news to at least some members of Habs’ Nation. Through a series of roster and personnel decisions which could be referred to as “strategic inadequacies”, the Canadiens have struggled down the stretch, winning just twice in their last 10 games. Now, no one is suggesting that the Canadiens have made a concerted effort to lose games in an attempt to guarantee themselves a higher draft pick. But let’s be honest, news of Hamilton Bulldog call-ups and Peter Budaj starts haven’t exactly broken any hearts either. While much of the focus heading into this year’s draft has been focused upon projected number one overall pick Nail Yakupov and current Sarnia Sting teammate Alex Galchenyuk, the Canadiens may actually be eyeing another Russian forward as their top choice. 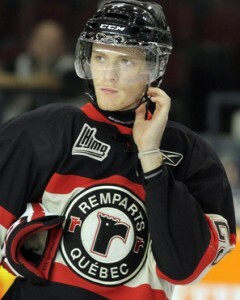 Widely viewed as the second best player available in this year’s draft, Mikhail Grigorenko is coming off an outstanding QMJHL regular season in which he posted 40 goals to go along with 45 assists in just 59 appearances. At 6’3, 200lbs, the 17 year old centre from Khabarovsk possesses both the size and offensive prowess which have been somewhat lacking in Montreal over the past several seasons. Despite his impressive numbers however, Grigorenko’s greatest asset may actually be what he doesn’t bring to the table. Of the three players mentioned, Grigorenko is the only one not to have missed a significant portion of the 2011/12 season due to injury. He missed some time following an ankle concern during the World Junior Championships, but all reports indicate that he is experiencing no lingering effects moving forward. Yakupov, on the other hand, has missed significant portions of the season following a serious knee injury suffered at the same tournament and a nasty-looking hit to the head which occurred just last month, requiring a number of stitches to his head and face and resulting in a possible concussion. Likewise, Galchenyuk missed almost the entire regular season following ACL surgery and upon his return on March 14th, played a grand total of one game before being sidelined yet again with an “upper body injury”. For a Canadiens squad which led the league in man games missed due to injury this season, drafting the healthiest player available may actually be a better option than drafting the most talented player available. As opposed to a team like the Edmonton Oilers, who are loaded with young front-end talent and can afford to be patient, or the Columbus Blue Jackets, who are in for a complete rebuild regardless of who they draft, the Canadiens need an impact player for the here and now. Drafting an injury-prone bust with their first premium quality draft choice in years could quickly turn into a public relations nightmare for the Canadiens’ new, yet-to-be-named General Manager. Factor in the ongoing whispers about the potential return of Patrick Roy to Montreal, and it becomes even more likely that it will be Grigorenko donning the bleu, blanc, et rouge on June 22nd in Pittsburgh. It is very likely that Yakupov, Galchenyuk, and Grigorenko will all go on to successful NHL careers. In fact, many scouts are singing the praises of this year’s top three, suggesting it is as strong as any draft class we have seen in the past fifteen years. But in a city where it seems like anything that can go wrong, usually does… the Canadiens would certainly be best off taking the safest possible bet.